With images of the recent tragedy in Haiti haunting us, it is all the easier to remember that even in this modern age, much of the globe doesn't enjoy such First World niceties as clean water, let alone building codes, a living wage or electricity. In a suburb of the Ghanaian city of Tamale, the small town of Jissonaayili struggles to educate its kids without much fresh water, with few robust structures, with a living wage of some $500 a year for its citizens and with no electricity in the schools. Set on the savannahs near the Sahara, Jissonaayili is just a few kilometers from what is called the "NGO capital of Northern Ghana," and not surprisingly, an NGO has set about to help the children there get wired. Called the Ghana Women/Children Collective of North America, this nonprofit group hosts a benefit for their efforts on behalf of Jissonaayili's school children on Sunday, Jan. 24, at the French Garden in Sebastopol. 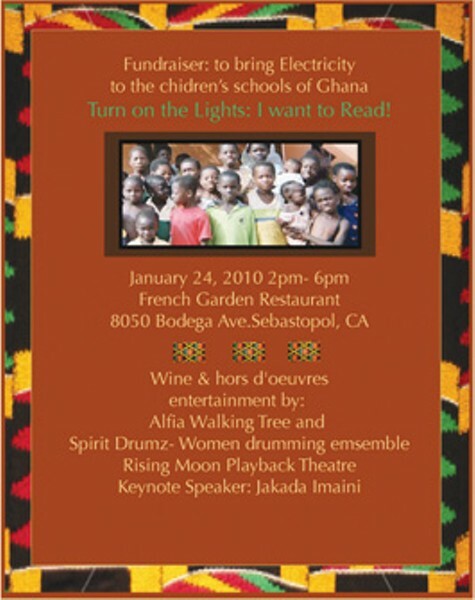 Called "Turn on the Lights, I Want to Read," the afternoon features entertainment by Afia Walking Tree and the female drumming ensemble Spirit Drumz as well as a performance by the Rising Moon Playback Theatre. Jakada Imani, executive director of Oakland's Ella Baker Center, will speak, and of course the French Garden's good food, currently served up by former St. Rose chef-owner Mark Malicki, makes everything in the world seem right. Mark it down for Jan. 24 from 2pm to 6pm at the French Garden, 8050 Bodega Ave., Sebastopol. $50, single; $80, couple. 707.604.7044.